BAGHDAD Bombs striking Shiite neighborhoods, security forces and other targets across Iraq killed at least 26 people Sunday, officials said, in the latest instance of coordinated violence to take a sectarian bent and undermine confidence in the beleaguered government. The deadliest attack came in the town of Taji, a former al Qaeda stronghold just north of Baghdad, where three explosive-rigged cars went off within minutes of each other. Police said eight people died and 28 were injured in the back-to-back blasts that began around 7:15 a.m. In all, at least 94 people were wounded in the wave of attacks that stretched from the restive but oil-rich city of Kirkuk in Iraq's north to the southern Shiite town of Kut. Spokesmen for the government and Baghdad's military command could not immediately be reached for comment, and no one claimed responsibility for the violence immediately. Car bombs however are a hallmark of al Qaeda in Iraq. The Sunni militant network has vowed to take back areas of the country, like Taji, from which it was pushed before U.S. troops withdrew last December. Shiite lawmaker Hakim al-Zamili, a member of parliament's security and defense committee, said the attacks were a sign al Qaeda "is still in business." He said a deadly weekend prison break in Tikrit in which many al Qaeda-linked convicts escaped, likely boosted the terror network's morale and spurred Sunday's assault. "Al Qaeda leaders have no intention of leaving this country or letting Iraqis live in peace," al-Zamili said. "Thus, we should expect more attacks in the near future. The situation in Iraq is still unstable ... and repetition of such attacks shows that our security forces are still unqualified to deal with the terrorists," he added. Shortly after the Taji attacks, police said a suicide bomber set off his explosives-packed car in the Shiite neighborhood of Shula in northwest Baghdad. One person was killed and seven wounded. Police could not immediately identify the target. "So many people were hurt. A leg of a person was amputated," lamented Shula resident Naeem Frieh. "What have those innocent people done to deserve this?" And in Baghdad's bustling Karradah neighborhood, a parked car laden with explosives went off next to a police patrol, killing a police officer and a civilian, other officials said. Eight other people were injured. The blast was followed minutes later by another parked car bomb as people gathered, killing three civilians and injuring 12 others, they added. Secondary bomb blasts targeting those coming to help the wounded are a common insurgent tactic. An Associated Press cameraman was knocked to the ground in the second explosion and an AP photographer was slightly injured. Elsewhere in the country, another suicide bomber drove a minibus into a security checkpoint in Kut, located 160 kilometers (100 miles) southeast of Baghdad. Three police officers were killed and five wounded, Maj. Gen. Hussein Abdul-Hadi Mahbob said. And in Iraq's north, another policeman was killed when security forces were trying to defuse a car bomb parked on the main highway between the cities of Kirkuk and Tuz Khormato, said Kirkuk police chief Brig. Gen. Sarhad Qadir. A second policeman was wounded in the blast, Qadir said. Kirkuk is about 290 kilometers (180 miles) north of Baghdad. In mid-morning, another parked car bomb went off next to a bus carrying Iranian pilgrims in the town of Madain, killing three Iraqis and injuring 11 others including seven Iranians, another police officer and health official said. Madain is a mainly Sunni area located 20 kilometers (12 miles) southeast of Baghdad. In the town of Balad Ruz, 75 kilometers (45 miles) northeast of Baghdad, a parked car bomb targeted a passing police patrol, killing two policemen and injuring seven others, a police officer and health official said. 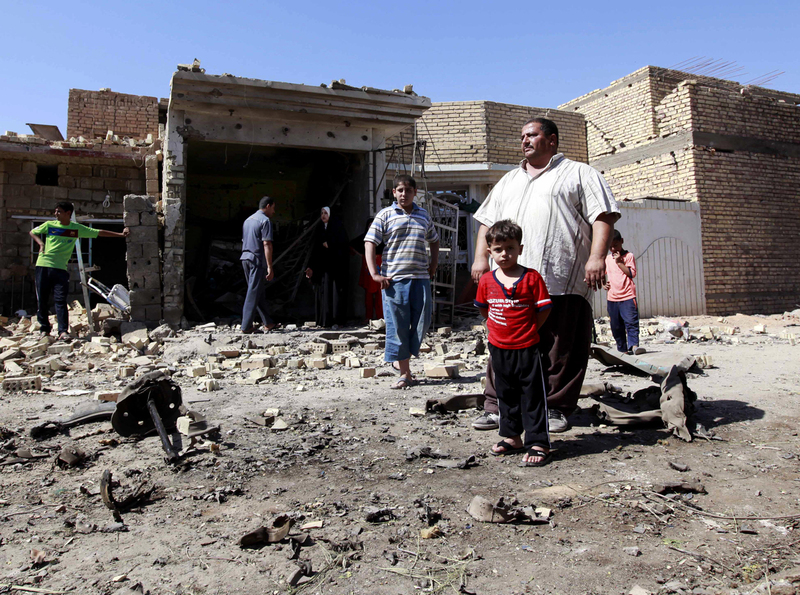 And in the nearby town of Khan Bani Saad, 15 kilometers (nine miles) northeast of Baghdad, yet another parked car bomb exploded near a market and killed one civilian and injured nine others, they added. Two Iraqi soldiers were killed in the town of Tarmiyah, 50 kilometers (30 miles) north of Baghdad, when their patrol hit a roadside bomb, another police officer and health official said. Six other people, including four civilians were wounded. Health officials in Taji, Tarmiyah and Baghdad confirmed the casualties. All officials spoke anonymously as they were not authorized to release information. Earlier this summer, the Iraqi wing of al Qaeda, also called the Islamic State of Iraq, launched a campaign dubbed "Breaking the Walls," which aimed at retaking strongholds from which it was driven by the American military. At its peak, al Qaeda in Iraq brutalized its victims with publicized beheadings, suicide bombings and roadside bombs that targeted the Shiite government, the U.S. military and Iraqi civilians. In an attempt to goad Shiite militias to respond, al Qaeda bombed the revered al-Askari Shiite shrine in Samarra in 2006 - an attack that launched Iraq's descent into more than three years of sectarian fighting. But the Iraqi wing of al Qaeda was shunned by the worldwide terror network's central leadership, which chided it for killing civilians. The insurgency made a series of other missteps - imposing overly strict Islamic discipline and alienating tribal leaders - that undercut its support in Iraq's Sunni communities and helped lead to the widespread defection of fighters to groups allied with the U.S. As a result, the flow of funding, arms and fighters slowed to a trickle, and al Qaeda in Iraq has struggled to command much power. Violence has dropped since the height of Iraq's bloodshed a few years ago, but Iraqi forces have failed to stop the attacks that continue to claim lives almost daily.